We welcome back our returning musical theatre campers to continue to build upon the foundation of growth discovered in the 3 or 4-week program, taking their study of voice, dance, and acting to the next level in our 3-Week Musical Theatre II Camp for teens. In addition to the advanced versions of the foundational classes, this camp will offer several extraordinary master classes from a roster of Broadway-level veterans who are dedicated to imparting practical insights and artistic inspiration directly to the next generation. · Acting Technique: Students in this workshop put to practical use the tools previous explored through games and exercises in the 3 or 4-week workshop. A single contemporary two-person scene, specifically selected for the students will be studied and work on in depth and detail, allowing students to make lasting discoveries. · Dance: In addition to building upon the previously acquired skills of ballet, tap, and jazz, hip hop dance will now be incorporated. 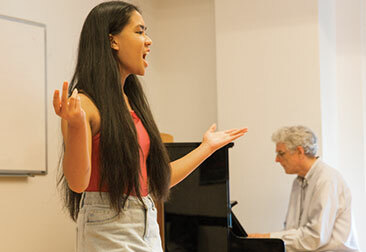 · Performance Lab: Students continue their work, immersed in the songs of individual composers and lyricists, giving special attention to finding and working on specific songs that enhance the individual temperament and vocal capacity of each student. The Lab workshops a variety of musical theatre selections to support a theatrical presentation at the end. · Voice Lab: In this class, students will learn the anatomy of how the voice works as well as learning safe techniques to access various parts of their vocal register. Taught with special care and guidance from one of our gifted voice teachers. · Pop Rock workshop: A unique two-class workshop introducing the genre and techniques on how to approach singing pop rock songs. · Musical Theatre Improv: Building upon the fun and exciting techniques learned in the 3 or 4-week workshop, this class will incorporate fresh approaches to the creative process. · Physical Comedy: A special movement class dedicated to the craft of working on comedic movement for farce and musical comedies. · A special field trip engaging with the Broadway community will be arranged, aimed at exposing the students of this extended camp experience to the inner workings of the profession. · Final Presentation: All students will present a final performance of work generated from the Performance lab and related classes.